A routine rout for Manchester City as they thrashed Shakhtar Donetsk 6-0 in Gameweek four of the UEFA Champions League, including a heavily controversial penalty decision which resulted in City’s second goal of the night. It’s not even about Manchester City winning or not; it’s about how many they score when they welcome their opponents to the Etihad Stadium. Thrashing Ukranian club Shakhtar Donetsk with an aggregate of 9-0 in two matches made this a heavily one-sided affair and City find themselves three points clear in first position in Group F of the UEFA Champions League. Gabriel Jesus got himself a much-needed hat-trick to boost his confidence, while David Silva, Raheem Sterling and Riyad Mahrez pitched in on the scoresheet too, as the latter set up three goals. With everyone quite used to City’s goal-frenzy performances, focus shifts to the most controversial moment of the night. “I went to chip the ball and don't know what happened. I didn't feel contact. I scuffed the ball”, said Sterling, after he kicked the turf and tripped accidentally. 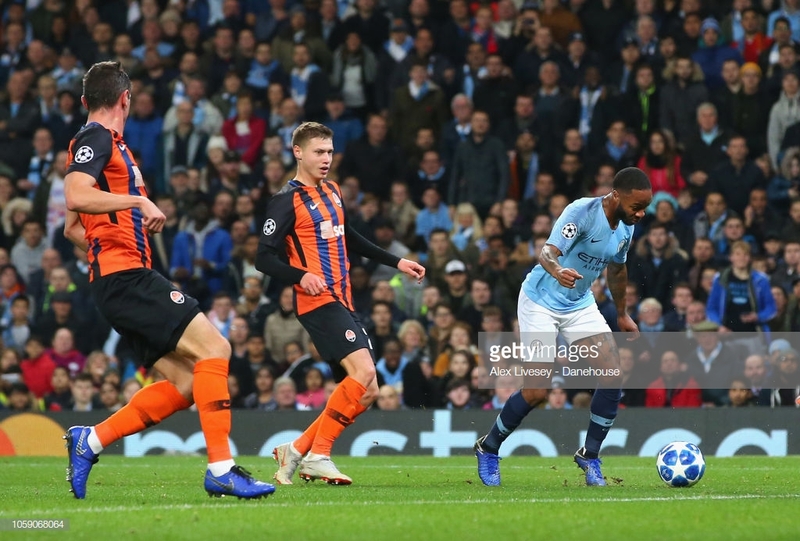 The referee Viktor Kassai surprisingly pointed to the penalty spot after he mistook Shakhtar defender Mykola Matviyenko to have fouled Sterling from the back. At this point in the game, City were 1-0 up with Silva’s goal and it's hard to say this penalty was game changing with the Premier League champions already in control - but this is no excuse to reward them with a hugely contentious decision against Paulo Fonseca’s men. Sterling dashed his way into the penalty box and was in good position to either score himself or tee the ball up for Jesus, but instead he fell as the ball ran out of play. The referee didn’t take time before blowing his whistle and pointed to the spot, much to everyone’s surprise. Matviyenko, who was so baffled, he couldn’t help but stare confusingly at everyone, ridiculing the referee's decision. Very surprisingly, even the City players didn’t retaliate against the incorrect call, as Pep Guardiola and the staff discussed the scenario while Shakhtar players surrounded Kassai and called him out, but in vain. Jesus calmly slotted the penalty home, but the stadium was more silent than cheery this time around, with everyone aware of the controversy which played a hand in City’s luck. In the post-match interview with BT Sport, Raheem Sterling bought into light the fact that he knew he tripped himself and wasn’t proud of the goal. “Apologies to the ref and apologies to Shakhtar”, he concluded. The Citizens scored six goals for the second game in the row, after they thrashed Southampton at the weekend 6-1, and then scored the same number of goals against the Ukranian club. It was no doubt a one-sided performance. Silva scored a tap-in early on as Mahrez’s turns left the defenders for dead as he found himself in space and fired the ball in the box for Silva to score. The Spaniard has now put the ball in the net in three consecutive Champions League games for the first time. Then came that controversial penalty decision that put City 2-0 up, and that’s how they ended their first half. Soon after the inception of the second half, Sterling made up for his penalty controversy by dashing towards the goal and curling it past goalkeeper Andriy Pyatov to make it 3-0. After a silent spell, a correctly-awarded penalty decision came as Silva was tripped in the area, and Jesus scored his second of the night. The last ten minutes was a Mahrez show as he scored one and then passed the ball to Jesus to complete his hat-trick and City’s usual goal mania. Not only did the scoreline flatter the hosts, but it was also a giant step towards the knockout stages, with their qualification certain in this game only had it not been for Hoffenheim’s late equaliser. City can qualify on matchday five, however. This was also the first time Manchester City scored six in consecutive games since November 1987, when they followed up a 10-1 second-tier win over Huddersfield Town with a 6-2 win at Plymouth in the now-defunct Full Members Cup. Sterling said: “It was a massive win. The Lyon match [1-2 home defeat in September] was one of those wake-up calls. You lose the ball and these good teams can punish you."